Ever notice how it's easier to write metal lyrics in English than it is to communicate normally in English? Exhibit A: French post-metal band The March, whose vocalist Olivier Haese peppered his e-mails to me with minor (and adorable) idiomatic mistakes like "Would someone on your website be interested in making a review of it?" and "I haven't received the receipt that says you've got it well." In contrast, the lyric sheet for The March's debut EP Dead Ends and Blind Spots has a telegraphic pithiness to it that feels like its own dialect. "Perfect lines, artificial edges / Plastic birds, fake water around us" howls vocalist Olivier Haese on "Ancient Seed," before eructating one of The March's many awesome seabeast-themed apocalyptic forecasts: "The giant shell is on its way / Let the beast crawl over the great seawalls / And swallow them all / Now celebrate!" 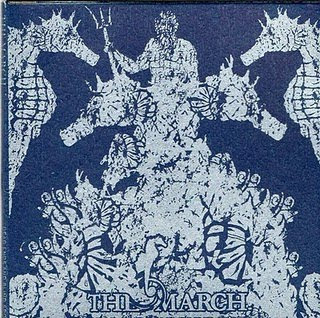 The March have also mastered the language of post-metal. Normally I dismiss this stuff as formulaic and one-dimensionally triumphalist, but the drama here feels real. The heavy sections come quickly, like each song's lifesblood instead of its payoff. There's a dryness to the recording that keeps the shimmery clean-tone guitars leaden and creaky. They're dripping in liquid mercury, not fondue cheese. Cymbals crash crunchy and live. Haese's vocals spew electricity. Extra points for the silkscreened package, laden with seahorses. Yes Olivier, I am interested in making a review of your album, and yes, I've got it well. Dead Ends and Blind Spots (self-released, 2009) is available by mail-order only. E-mail zguidon@hotmail.fr for your copy.